Just over a hundred years ago Mexican General Pancho Villa crossed the border in to the United States in a rather foolhardy raid. Today the two countries celebrate years of goodwill and friendship with the annual Fiesta de Amistad, locally known known as the Cabalgata. Horsemen arrive from Arizona and Texas to join New Mexican riders at the border post of Palomas, Mexico. 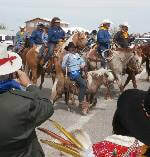 Horsemen from Mexico cross over to join them and they ride in solidarity behind the flags of Mexico, U.S.A. and New Mexico along the two miles to the tiny town of Columbus, New Mexico for the day long fiesta. It is an uplifting, wonderful and fun atmosphere, especially in this time of derision and hateful political posturing. During the 2017 Cabalgata I kept thinking, "This is the real border!" and you can experience the joy and comraderie during the 2018 Cabalgata on Saturday, March 10. Cabalgata translates to English as horse riders. The Friends of Pancho Villa State Park plan to hold an art exhibit in the historic Custom's Hall located in the Park. The State Park has an excellent little museum in the Visitor's Center within the park. The day also includes lectures in the Pacho ViIlla State Park which clarifies history from myth. It's interesting to discover, for instance, the birth of the American Air Force took place in Columbus.